For those of you who aren't on Facebook, you can visit my Why Won't Your Photo?! 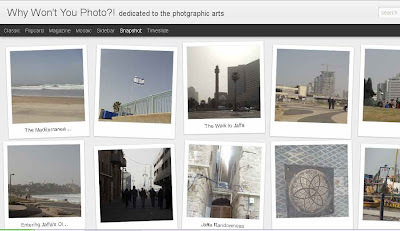 site to see some of the photos that I took during my trip to Israel. Today I've posted a series of shots taken during my first day in the country while Lynda was working. I walked from Tel Aviv, along the Mediterranean coast to the old historic area of Jaffa. I created a sorted list of posts that highlight the photos that I took in Jaffa. You can access the site from this link: Why Won't You Photo?!\Israel. Labels: Israel, Jaffa, Travel, Why Won't You . . .